Pat Wilson, Carrot’s CEO, is responsible for business development and maintenance of all client SDKs. During his tenure with GarageGames, Pat was responsible for creating the next-gen lighting system for the Torque Engine, was the Console Lead (where he was responsible for shipping more than five titles), and published the paper “Light Pre-Pass Renderer: Using the CIE Luv Color Space, ShaderX7.” When he is not fine-tuning SDKs for clients, he can be found rocking with the “Legion of Everblight,” playing “Civilization V,” or beating his head against a chess board. Carrot is a Corona Plugin partner, and is available to all Corona SDK developers. For more information, please see Carrot’s plugin documentation. In the crowded app market, getting people to find and use your app can be tricky. Marketing is expensive, app store discoverability is increasingly difficult to get, and paying for installs can quickly dry up the cash of any studio, large or small. Carrot addresses these issues by making sure that your players bring in more players through the use of “viral stories” on Facebook. These are the same posts that you’ve probably seen coming from apps like Candy Crush Saga, Spotify, and Netflix. These posts show friends performing activities in an app and they put your content in front of potential new users. Carrot gives you a drag-and-drop web tool to create, preview, and manage your viral stories and combine them with side-by-side metrics that help you determine which viral content works best. Your artists and content authors can apply edits, try out new wording and images, and see them retroactively applied to all existing posts on the fly, without re-deploying your app. Carrot is truly a power-tool for viral content. Our “Download Code” functionality will generate the code snippets you need to send out your viral stories from a Corona SDK app. You can implement Carrot within an existing app in less than an hour — even within minutes if Facebook is already integrated into your app. 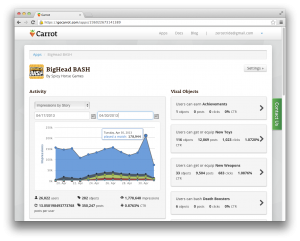 The Carrot social-backend is now closing in on 3 million Facebook posts. Each week, over 500,000 new posts are made, and over 1.6 million unique people see those posts, driving clicks directly to our customers’ apps. Our partnership with Corona Labs allows us to provide Corona developers with easy access to the power of Carrot, giving their apps the exposure needed to compete in a crowded marketplace. We are excited to be working with Corona SDK developers, and we’re ready to help you get your app in front of more users. Sign up today! I have read about Carrot before and never understood why it’s needed. As far as I can see by looking at your website, you post stuff to my users Facebook wall about things that happen in my game. Why should I pay you to do that, when I can do it myself ? We don’t post to the wall, that is FarmVille style spam, and has been deprecated by Facebook. We use Facebook’s custom Open Graph actions. These are not only way more effective than the previous “wall spam” posts, but they allow for better metrics and measurement of the impressions and clicks that your content receives. They get collected into sets of information so that people not only see that their friends are playing a game, but they see what about that game is compelling. 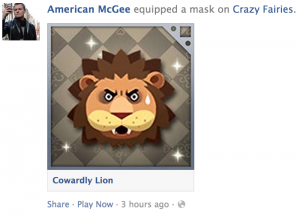 Every game has a story to tell, in the screenshot from this blog, American “equipped” a “mask”, the specific mask was the “Cowardly Lion”. This lets you put content from your game front and center in front of potential users. If someone clicks on that, Carrot makes sure that they get directed right to the appropriate App Store for your game. Carrot gives you a easy to use CMS for all of these objects, so that you can instantly update text, images, and have those changes be retroactively applied to *all existing posts of that object*. Combined with the metrics, this lets you tune your messages to find out what is the most effective way of getting more users. Carrot’s SDK and social-backend also co-operate to make sure you don’t lose posts. If your player is playing on their phone on a subway, the SDK uses an SQLite cache to store their actions so they can be sent to the Carrot server when the player gets connected again. Our social-backend is a multi-availability-zone AWS stack which queues posts so that when Facebook goes down (and they do several times a month) posts don’t get lost, and will be sent when Facebook is available again. They’ll even be “backdated” so that they appear in the correct order. Simply put, Carrot is the most powerful solution for social sharing. I only understood the first line of your reply unfortunately. Carrot posts the story to the user’s Facebook feed. Isn’t feed just another name for wall! Great question, and I’m sure there are other people confused about this. When you write a status update, or upload a photo, or ‘Like’ something, that creates a post on your Wall (aka Timeline). Anything which is added to your Wall generates a News Feed story, and your friends will see that news feed story. The type of posts that you are talking about get posted to your wall, and all of your friends will see each post. This is what was known as ‘Wall Spam’. Custom Open Graph actions do not show up on your Wall, they are collected into groups of stories. For example: each time someone listens to a song on Spotify, that song does not show up on their Wall, nor will it show up instantly in their friends’ News Feeds. Instead Facebook gathers these actions into a collection of songs you listened to, and this collection will be shown on friends’ News Feeds about once per day. By gathering and grouping activities that friends are performing and then presenting them in a non-spammy way, Facebook greatly increased the ability for Apps to present their content to potential new users. It also makes it possible to manage the content that is posted. That explains it very well, thanks. Maybe some of your answer above could be used on your website to explain it more, as people might be thinking like I was and not think they need your service. I think you’re getting hung up on “Why should I pay for something I could do myself?” and not paying attention to what the Carrot actually does for you. For one, you save on development time. You get the functions of Open Graph wrapped up in a pretty package, with an intuitive CMS. What’s more, cross-platform projects (like what our team is developing) can be extra tricky when delivering to Apple, Android, Facebook, and other web distributors. You’re right, you could implement your own system with Open Graph. If you’d like to do that, you can save yourself a few bucks. However, in the long run, would you rather spend your development time integrating social media marketing or developing your actual product? In my opinion, it is more valuable to spend precious development time on my product and getting it to market quickly. This doesn’t work on corona even it’s initialized successfully. I’m sorry you are having trouble with the SDK. We have games that are built in Corona that are live and posting with Carrot so I’m sure we can figure out what is going wrong with your game. Contact us via your Carrot account (the ? icon in the bottom left corner) and we will get your issues resolved!